I can tell you exactly what it was made me pick up this book for review (and what it was not). It was the comparisons (yes, multiple) to one Anna and the French Kiss. It was not the cover. Yeah, the colors are pretty and the font is nice. But otherwise it's just awkward. And cheesy. And this book is neither. I think I would have left it at the fence and skipped the junior high dance pose couple. Because while this book does have a romance in possession of the kind of heat you do not want to miss, that couple does not do them justice. There. I've said it. We shall move on. I wasn't planning on reading My Life Next Door at all, until I read the aforementioned comparisons and early happy reviews. Together they pushed me over the edge, and I went ahead and took the plunge. I mean, who in their right mind doesn't want to read a debut in the same vein as a Stephanie Perkins novel? I am pretty much incapable of resisting that lure. So. Samantha Reed has a secret. One she keeps from her high-powered, ambitious, and judgmental mother. She watches the Garretts next door. Sort of like a hobby. Her mother despises their next door neighbors, with their constant noise, eight active children, and inability to keep their lawn in order. But Samantha? She is fascinated by them. They're everything her little family of three is not. Gregarious, messy . . . happy. With her mother always campaigning for office and her older sister absorbed in her boyfriend and summer job, Sam is content to watch the Garretts. Until she unexpectedly makes the acquaintance of the third-oldest Garrett--Jase. And everything changes. Samantha tries desperately to keep it on the down-low, knowing full well how badly her mother will react. Knowing that one wrong step could mean she won't be able to keep them. And that is exactly what she wants. Because it doesn't take much time spent in their actual company for Sam to fall head over heels in love with not just Jase, but the whole lot of them--this twirly spectacle of a family who, unlike the Reeds, seem to have a firm grip on what it means to love each other and know who you are. The Garretts were my bedtime story, long before I ever thought I'd be a part of the story myself. When I get home from work the next day, sticky from walking back in the summer heat, my eyes immediately turn to the Garretts'. The house seems unusually quiet. I stand there looking, then see Jase in the driveway, lying on his back, doing some kind of work on a huge black-and-silver motorcycle. I want to say right here that I am by no means the kind of girl who finds motorcycles and leather jackets appealing. In the last. Michael Kristoff, with his dark turtlenecks and moody poetry, was as close as I've gotten to liking a "bad boy," and he was enough to put me off them for life. We dated almost all spring, till I realized he was less a tortured artist than just a torture. That said, without planning, I walk right to the end of our yard, around my mother's tall "good neighbor" fence--the six-foot stockade she installed a few months after the Garretts moved in--and up the driveway. "Hi there," I say. Brilliant opener, Samantha. Jase props himself up on an elbow, looking at me for a minute without saying anything. His face gets an unreadable expression, and I wish I could take back walking over. Then he observes, "I'm guessing that's a uniform." Crap. I'd forgotten I was still wearing it. I look down at myself, in my short blue skirt, puffy white sailor blouse, and jaunty red neck scarf. He nods, then smiles broadly at me. "It didn't quite say Samantha Reed to me somehow. Where on earth do you work?" He clears his throat. "And why there?" "Breakfast Ahoy. Near the dock. I'm saving up for a car." Jase scrutinizes me in silence for a minute or two, then says, "He must have a rich fantasy life." Great, isn't it? Which leads me to where things lost their fizz a bit for me. There is a conflict involved in the story (naturally) to do with the problem of Sam's mother seriously disliking the Garrett family in general. This conflict did not work for me. Instead of folding neatly into the story, it felt forced. Everything else was humming along so well (see the passage above), and this crisis felt fabricated simply for the sake of having some kind of conflict and resolution. I understand the reasoning, I just felt that in this case the story didn't need it. I would be happy to read about Sam and the Garrett family for ages of pages. When characters are that well drawn, I don't require a flimsy conflict to satisfy my need for drama. Pointless drama aside, My Life Next Door is a fun and knowing portrait of family, first love, and growing up. With it, it felt needlessly taxing and predictable. I pressed through the last section missing the quiet warmth of the first two-thirds. This will be a quibble (or even a complete non-issue) for many of you, and I still grin widely when I think of a few of the more memorable moments. So if any of this leaves you at all curious, be sure to check it out for yourself when the time comes. 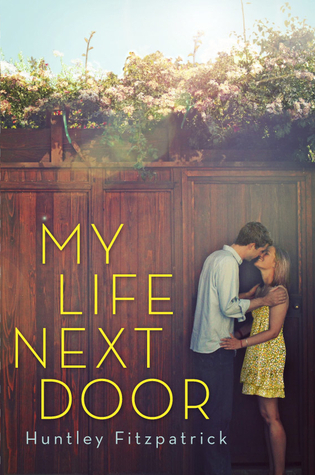 My Life Next Door is due out June 14th. I haven't read Stephanie Perkins yet. Her books have been recommended by everyone under the sun, I know. I think I'm afraid that the books just can't live up to the hype. That said, I DO want to read this book right away. I am a bit worried by the Sarah Dessen comparison, though, because her books are hit-or-miss for me. Cecelia, I get that. I've done the same thing countless times. I do recommend reading ANNA when you're feeling it. I prefer it to this one, but this one has its moments, too. I'd like to try this. In a way, the premise reminds me of the movie Sabrina. Did you find that to be the case? Lin, ha! I hadn't thought of that, but the watching from afar bit is totally in line with Sabrina. The class issue is there to a degree as well, though in reverse and nowhere near as marked. Omigosh you make me wanna read this book so much now after reading your review. I see what you're saying about the cover and i agree, it's awkward. However, the story makes up for that. Great work! Shane, ooh, I'm glad it was inviting. The story definitely outshines the cover. I mean, there's nothing really wrong with it, but the characters deserve more than that. You know? Well my friend and I were just bemoaning the fact that Sarah Dessen didn't have a book out this summer, so I'll definitely pick this one up! I'd already seen the cover on a few blogs and thought - no. So thanks for the review. Alexa, well there you go! This one should be a slam dunk. I am not a fan of flimsy drama, but you know what, I am a HUGE fan of big huge loving families, so ahhh, I am psyched about reading my copy just to meet The Garretts! April, I do know that about you. :) LOVED the Garretts. Think you will too. Looking forward to your thoughts, Chachic. Hmm. I like a lot of elements of the cover but you're right, the couple kissing isn't so great. It's too cutesy. i love how you have reviewed this ~ gives me the exact vibe/impression. LOVE the quotes you included. Nomes, oh, good. I'm glad it worked! This would be a lovely rainy day read. I am really waiting for this book - not sure what made me want to read it so badly, but here I am. I've added this to my wish list after reading your review - it sounds charming and light, just perfect for summer (ha! I'm in Scotland and summer has yet to make an appearance). I am not surprised that it has not met the dizzy heights of ANNA, though - what could?? Sya, awesome! It is both of those things. And you're absolutely right. I should have naturally lowered my expectations. Nothing is like ANNA. It's funny that you said that comparisons to Sarah Dessen are more apt, because as I was reading your plot description, I kept thinking about THE TRUTH ABOUT FOREVER. Either way, I really need to read ANNA AND THE FRENCH KISS and then this one. Jessica, that's so funny! Well, there you go. Hopefully Dessen fans will feel the same way. And definitely keep ANNA on your TBR. Such a treat, that book. Shannon, sigh. Yeah. For what it's worth, I was much more on board with Jase than any of Dessen's boys. MUCH more. And the family is worth the read for sure. But the overdone drama impeded my complete enjoyment. EEEEEE My Life Next Door! Definitely one of the best YA contemporary novel I read this year ;) I really enjoyed reading the book and Samantha + Jase's relationship was very adorable and sweet. Awesome review, Angie ♥ Glad you enjoyed it!